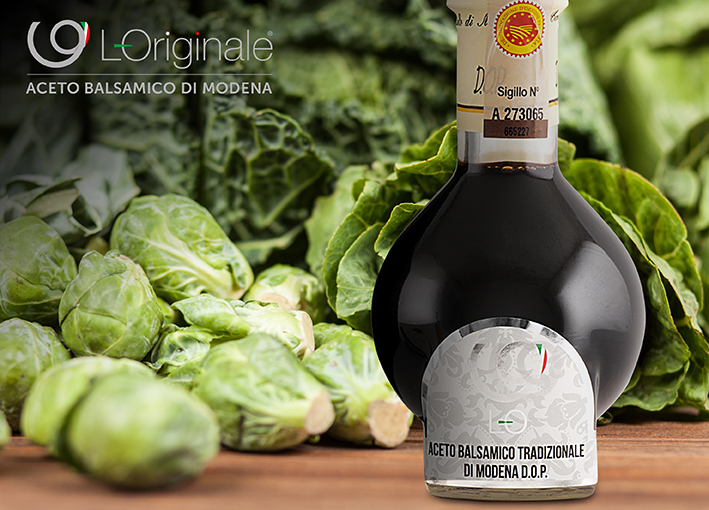 Brussels sprouts salad – Today we propose you a recipe with Original Balsamic Vinegar and…pomegranate! This fruit is excellent for purifying the body; in fact, the pomegranate is low in calories and rich in water and fiber. Furthermore it contains a high amount of vitamin C, one of the greatest ally of the immune system. Finally, it can also provide a valid antibacterial and anti-inflammatory action for the organism. For the dressing of the salad: mix the extra virgin olive oil with Original Balsamic Vinegar, a pinch of salt, a sprinkling of pepper and set aside. At this point, toast the pumpkin seeds in a non-stick pan for a couple of minutes over medium heat; when they start to crackle, remove from them the heat and pour them into a small bowl to let them cool. Immediately afterwards, finely slice the Brussels sprouts and open the pomegranate to remove the grains, then cut the hazelnuts in half. When you have prepared all these ingredients, prepare the salad by placing the sliced ​​Brussels sprouts, raisins, pumpkin seeds, pomegranate grains, hazelnuts and the seasoned dressing. Then mix all the ingredients and sprinkle the salad with sesame seeds. The Brussels sprouts salad is ready! Check our blog for other tasty salad recipes and many other dishes!